NLD RFU would like all players from the age of 13 upwards, including Seniors, to complete an online survey giving your views on different aspects of the game. As the heading says, it is ‘Your Game’ and this is the chance to have ‘Your Say’. The survey is for players to gather your own views. Once we have your thoughts, we can review how our competitions/playing offer meets the needs of players in our modern game and if need be, amend our offer as a CB. This will also give our clubs further understanding of their players wants and needs. Please complete this survey by the end of April, so we can review the results. NLD RFU are seeking to appoint a ‘Head of Rugby Growth’. This is a great opportunity for an individual that is passionate about the sport to get involved in developing all areas of the game but specifically Women & Girls, Touch and Sevens rugby. For more information please see attached a copy of the job description. Expressions of interest should be sent to Nicole Brown via email ([email protected]) by Friday 17th April 2015. This is a voluntary position with expenses paid. For more information or an informal chat about the role contact Dan Sutton on 07702 301440. Students from across the College took part in a touch rugby tournament with England Rugby’s Delivery Team at the College’s Clifton centre earlier this week. RFU Rugby Development Officer Andrew Highton and Community Rugby Coach Calvin Beech led the event, which was designed to introduce touch rugby (a modified version of the game where tackles are replaced by touches), encourage sports participation among students and promote the College’s Rugby Academy. 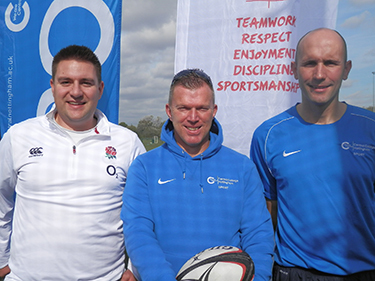 Pictured L-R: Andrew Highton (RFU Rugby Development Officer for Nottinghamshire), Roy Reece (Head Coach, Central College Rugby Academy), Glen Read (Central College Sport Academy Manager). Andrew said: “Colleges have a key role to play in getting young people into the sport. We’ve found Central College to be very pro-active, running the Rugby Academy and raising the profile of the sport, and the variations of it, through sessions like this. “The Rugby Academy allows both experienced players and newcomers to get together and play, developing their skills while enjoying the sessions. Students will take part in training sessions which run twice a week, and benefit from the knowledge and experience of the coaches in the Academy. Over the next four weeks O2 Touch and England Rugby will be uploading exclusive fitness videos featuring fitness guru to the likes of Pro Green, Millie Mackintosh and England Rugby player James Haskell. 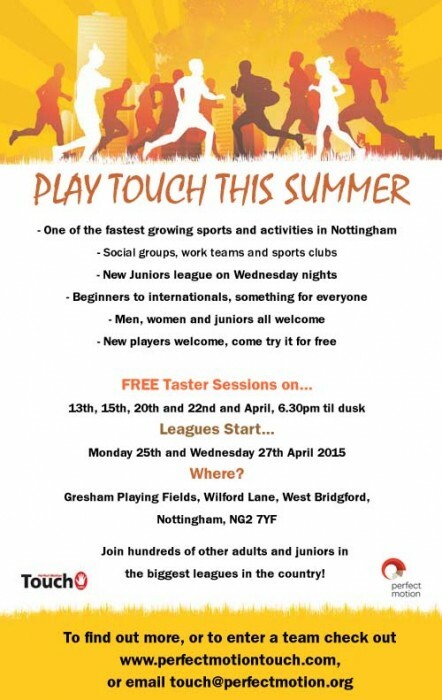 This series of videos will help you get O2 Touch Fit and are a great supplement to weekly touch rugby activity. Each workout session will take on a different focus, helping you work on your mobility, speed & strength, conditioning and power across the programme to help you take your performance to the next level. O2 Touch Fit is a great way to get in shape and boost your social life. Each week starting Monday 28 July there will be posting a workout to improve your game. Join the challenge now by using #O2Touch on Twitter.